Linda Mandarin, Chinese Edge, and Korean Explorer form a local language school offering Chinese and Korean language classes for corporate and individuals. Having already established their presence on Search Engines for Chinese Edge and Korean Explorer, Linda Mandarin wanted to increase their volume of free trial class signups and attended Equinet Academy’s Facebook Advertising course. They took to Display Advertising via Facebook Ads to deliver Sponsored Newsfeed Ads to website visitors who browsed their website, but did not sign up for a free trial class. By installing a Facebook Pixel on their website, Linda Mandarin was able to track their website visitors’ behaviour and create Custom Audiences to retarget ads to their website visitors who had a Facebook account, but hadn’t yet signed up for a free trial class. In one Facebook Sponsored Ads campaign with Conversions selected as the ad objective, Linda Mandarin acquired 21 contact form enquiries at the cost of $10.38 per lead. As you can see in the table below, an A/B split testing experiment was conducted. Two ad creatives, one with the call-to-action “Claim” and one with the “call-to-action” “Sign Up” was ran side by side, and the winner appears to be the first ad with the word “Claim”. 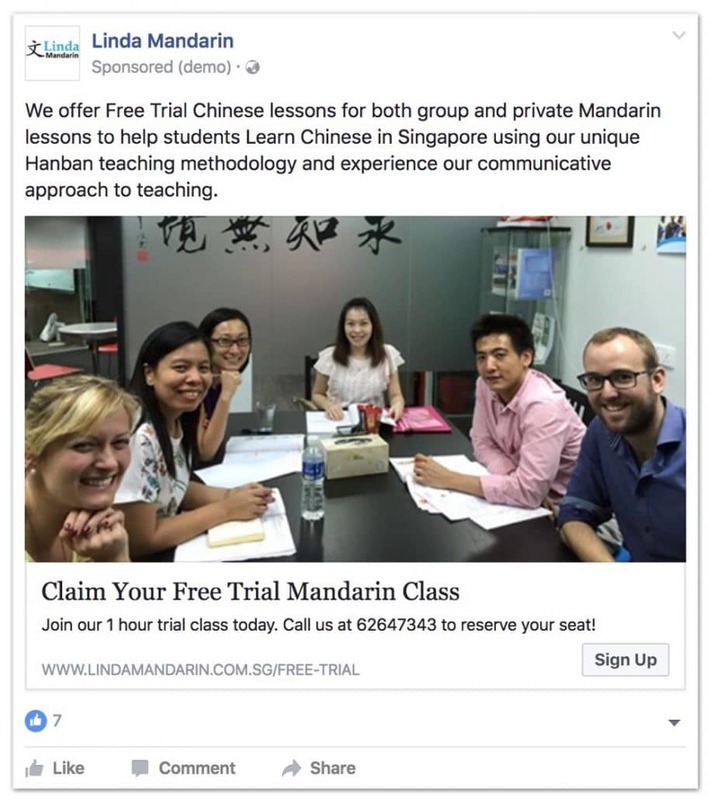 As a collective result of all Facebook Ad campaigns ran, Linda Mandarin saw a 20% increase in free trial class signups. Source: Lawrence Foong, Founder of Linda Mandarin, Chinese Edge, and Korean Explorer, who attended Equinet Academy’s Facebook Advertising course.